Give Us a Couple of Hours and We'll Show You Everything You Need to be a Natural, Authentic, Engaging, and Yes, Even Funny Speaker! Engage an audience easily and powerfully? Deal with the unexpected in a way that turns it to your advantage? Be dynamic and charismatic from the platform? Tell powerfully engaging stories that make your point? Develop you natural sense of humor to make your presentations funnier? Well now you can! This innovative training system will give you the skills to quickly and easily learn how to be a dynamic, engaging, entertaining, and yes, even funny speaker! Whether you have to occasionally give a presentation for work or are a professional speaker delivering hundreds of speeches a year, whether you are the CEO of a Fortune 500 Company or a student taking classes, speaking is tough! You get nervous (or maybe terrified!) even thinking about the speech...? You feel like you know your stuff but you're not getting ahead at work because you don't speak well...? You have "great content" but your audience never seems to "get it" (hint: it's not your audience's fault!)...? You have a reputation for putting your audience to sleep...? You struggle to come up with content to use in your speech...? "Even after three years of experience in public speaking and winning speech competitions, I still find Avish and Fred's product "Improv for Speakers" extremely helpful in my growth. The improv activities that he shared were not only creative but effective. My quick thinking abilities improved tremendously. I have never been voted for Best Table Topics Speaker in Toastmasters before but ever since I studied the product, I started winning ribbons. And here's the best part -- I actually have fun speaking off the cuff! You rock!" "'Improv for Speakers' by Avish Parashar and Fred Gleeck impressed me in the most unexpected of ways. I popped them into the DVD player in my truck rental while driving around Nebraska, and found that even audio only, they were packed with great information, exercises, humor, and actionable techniques to help speakers Speak & Deliver with more energy and spontaneity than ever before. I highly recommend this program to speakers old and new, whether you need a primer or refresher on the benefits of energy, quick wit, and preparation for being unprepared." You Won't Get This Anywhere Else! The DVD is filled with over 20 exercises from the world of improvisational comedy, all designed to help you become a better, more natral, more engaging speaker! As far as we know, we are the only people in the world using improv comedy techniques to teach speaking! You have probably seen the studies that say that people are more afraid of public speaking than they are of death. Imagine how much more terrified those people would be if they didn’t even plan what they were going to say in advance! Improvisers must be able to engage and entertain an audience with nothing to rely on but their wits, skill, and experience. It sounds difficult, and yet, night after night, successful improvisers keep audiences watching and laughing for hours straight. How do they do it? Do they have some magically ability that allows them to entertain? Successful improvisers are successful because they have learned skills and approaches that let them create instant entertainment. Basically, they’ve learned a system. Now, you can use the same system that improvisers use to create phenomenal performances to be amazing from the platform! Who Should Get These DVDs? How to end a story that has no ending…(or what to do when the story doesn't "work"
Great Content PLUS Great Exercises! This DVD set, contains over 20 improv exercises you can use to become a more powerful speaker. Ideally, you will practice the exercises yourself. However, because of the demonstrations, explanations, and application dicsussions, you will get tremendous value from the DVDs, even if you never play a single one of the improv games! Fred Gleeck is a professional speaker, seminar leader, and information marketer who has been improvising for the last 20 years. Fred has long believed that the secret to being a great speaker is to simply know your content and know how to perform improv comedy. Fred generates an average of more than $700 for each minute he's speaking in front of a group. For every speaking engagement he accepts, he turns away three potential clients whose terms just aren’t up to snuff. Each day, the mailman brings him a stack of checks (and half the time, he doesn’t even remember what people are sending him money!). He takes at least 8 weeks of vacation every year and has two homes, one in New Jersey and the other in Las Vegas. Avish Parashar is a professional speaker who uses ideas from improv comedy to teach groups to be more creative, to work better as a team, and to improve their productivity. 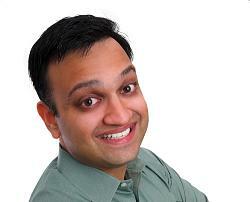 Avish has spent over 15 years performing, teaching, and directing improv comedy. "I found your seminar to be inspirational - you have given me concrete, specific information - things that I can actually do. Thank you." "A lot of great, useful ideas in a short time - very information-dense." "Content Packed . . . Fast Paced . . .Multi faceted . . . Stimulating . . Generous!" "Fred’s . . . seminar generates, motivates and activates one’s excitement to just go out and do it. Take each part of the . . . process and be challenged by it, not afraid of it." -Sora Vernikoff, Author of Eat What You Want! Stop When you Want! "All of this information was very good. This information at this time is almost like a message from above . . . It was so power packed with good stuff that I cannot believe I am getting this gift right when I needed it. Thank you. I am just awestruck by the fact that all of this information has been so timely for me." "I give him a 10. Fred Gleeck is fantastic. Super! Outstanding! He tells you what to do, how to do it, and he sets you in motion for success. A day with Fred Gleeck is a day on the road to success." "I rate seminars according to their return on investment. Any time I've invested in any of Fred's seminars has resulted in a tremendous return. You cannot afford not to take Fred¹s courses." "Fred Gleeck's products are a road to success in business and in life. I'm glad that I get to learn from the best." "A ton of information that was valuable in a short amount of time without being overwhelmed." "When the student is ready, the teacher appears!" "Highly positive, energetic and engaging. Tonight's program stretched my comfort zone - I got a bit uncomfortable and it felt good to be outside"
"Loved it! Learning how to collaborate can be fun with Avish leading the way!" "The most fun I've had learning"
"Avish has depth of experience - working in the Fortune 500 (Chase Manhattan) -and working for applause. He calls on both backgrounds to be a credible advisor to business minds and to flaky folks like me"
"I'm inspired! In one hour, Avish helped me to become more creative - and therefore more effective in my work and in my personal life." "Possibly the best one I have seen at CCHRA. Avish rocks!" "Exciting and motivational - with a personal touch"
"It was excellent. What a unique way of addressing marketing & sales. A different (or creative) approach to marketing solutions"
"Something happens to us between childhood & adulthood. Avish helped me find the tools to bring back the sense of wonder through unblocked creativity. I can't wait to master it." "Avish is passionate about what he does and his ideas are right on track"
-Debra Mikulak, Director of Operations, Patricia Schultz Enterprises, Inc. This is absolutely, positively, the most powerful information out there about being amazing from the platform. If you just follow the simple system, you will be an amazingly engaging and entertaining speaker. But don't take our word for it. Try the system out. Give it a test drive for yourself. If you're not delighted with the results you get, we DEMAND you request a refund. Is this a 30 day guarantee? A 60 day guarantee? Nope. At any point, for the rest of our lives, if you aren't 1000% delighted with the material, pack it up and send it all back. We wouldn't want you to keep the system if you didn't feel that it was worth at least 10X what you paid for it. The investment is so small it's almost laughable. If you order now, your investment for hours of practical exercises and advice in DVD format is only $197! Your investment is completely risk free. Get the program, watch the DVDs, practice the techniques. If you don’t agree that the time-tested tips and tactics we share will help you become amazing from the platform, just return them for a full refund. We don't know what else to tell you except . . .
Add to Cart (in the U.S.)! Add to Cart (outside of U.S.)!